As you might have figured out already I'm a little OCD in my baking and I don't like to cut corners. 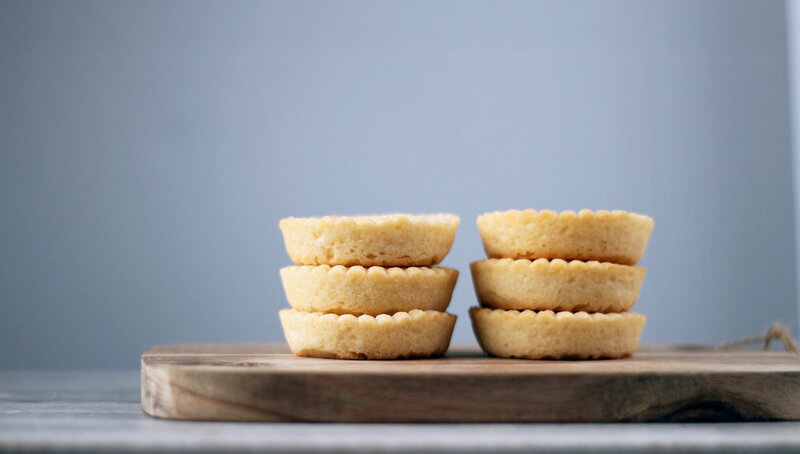 There is nothing wrong with cutting corners, like buying ready made tart shells, but for me, nothing compares to the taste and texture of homemade ones. Especially if you decide to go all out by making them dairy and use butter, but unfortunately in a kosher lifestyle, we need to keep things dairy-free (parve) most of the time. I often find that the pre-made, store bought tart shells have a chemical after taste to them. This is why I go through the trouble of making them myself parve or dairy. The dough only takes one minute to come together. They bake in 12 minutes (for the mini sized ones) and keep very well in the freezer. So when I make them, I make a couple of batches to keep the extras in the freezer ready to use whenever I need them. Mix the flour, sugar, salt and baking powder together on a working surface and make a well in the middle. Place the egg, butter and 1 tbsp water in the well and mix everything together with yours hands until a mixture that just hold together is formed. If the dough is too crumbly and doesn't stay together, add the other tablespoon of water. Stop mixing as soon as the dough comes together and do not overmix. Wrap the dough in plastic film and refrigerate for at least one hour. Roll out the dough on parchment paper, or on a silicon mat, to a thickness of about 2mm. cut out circles that are bigger than the tart shell molds you're using (if you don't have silicone molds you can bake them in greased muffin pans. They come out just as nice. Insert the dough circles gently in the molds and make holes on the bottom with a fork. Now, if your filling the dough before cooking them that's fine, but if your cooking them empty you want to fill them with some weights (like chick peas) so that they stay flat. If you don't have anything on hand to weight the dough down, you can cook them half way, remove from the oven, flatten them with the back of a spoon or with your fingertips, then continue baking. The total baking time for mini tart shells is about 12 to 15 minutes.